In the last week the Outdoor Retailer Show has seen several companies state their opposition to the policies of Utah’s Governor Gary Herbert by announcing that they will not be attending this summer’s Outdoor Retailer Show in Salt Lake City, Utah — Patagonia, Arc’teryx, and Polartech just to name a few. With all these announcements the group that stands to lose the most is the Outdoor Retailer Show itself. And we wondered what their response would be. In a open letter to the outdoor industry titled Our Goal is Not Just to Speak. Our Goal is to be Heard, OR Show Director Marisa Nicholson said today (Tuesday, February 14, 2017) that while several companies have announced they are leaving, other have showed their support. While Nicholson says OR respects the larger company’s decisions, the people she says the boycott hurts most are the smaller brands. But the boycott of Outdoor Retailer levies the most significant negative impact on those medium and small-sized companies that count on the show to conduct business,” Nicholson says. “We have a unique, maybe even singular, opportunity to coalesce, organize, speak and lay plans to make a difference around public land awareness in such a way that it is not only heard but that it can make a positive difference. Yes, trade show directors still believe that trade shows are important, and so do some brands, but Utah’s governor certainly isn’t helping anyone out by being staunchly against the protection of wilderness lands. Nicholson says Outdoor Retailer is “as swiftly as humanly possible” looking for alternative locations to hold the show. So there’s that. For Nicholson’s entire letter, please follow the jump. We continue to be entertained by the ironies of Patagonia’s drive to sell us all more clothing we don’t need ($35 “Live Simply” T-shirts) as well as their commitment to using the environmental movement to market their brand. Occasionally, however, it all comes together into something interesting, and maybe even good. Sweetgrass Productions‘ Jumbo Wild appears to be one of them. The film, funded by Patagonia, covers the “decade’s long fight over a proposed ski area” in the Jumbo Valley backcountry, part of British Columbia’s Purcell Range. Be warned, there is far too much skiing in this clip. For more on the story (and the film), please follow the jump. Thirty years ago a group of surfers from Malibu, California, were concerned about the health risks associated with environmental threats posed by escalating coastal development at their favorite surf spot. They took action. Not even they could have envisioned the history they were making when they succeeded in protecting their beloved surf spot. . . .Since its inception in 1984, the Surfrider Foundation has evolved into one of the largest non-profit grassroots organizations with a volunteer-activist network dedicated to its mission to protect and enjoy the world’s oceans, waves and beaches. . . . Today, the Surfrider Foundation is measurably stronger, with more force and movement than ever before. It has 84 chapters, including 30 high school and college clubs, 50,000-plus members and more than 250,000 supporters and volunteers, fighting 90 active campaigns around the country. Armed with a model to defend the coast the organization has a record of 271 victories (and counting) since 2006. Happy Birthday, Surfrider. You are living proof that good people can do great things when they work together. For the rest of the timeline, click the link. Jon Rose and friends are making valiant efforts to get clean water to people who need it through his Waves For Water initiative. 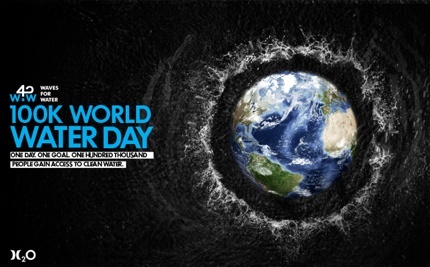 Now, Nike is taking this opportunity to upgrade their social conscience (and their Hurley surf division) by participating in World Water Day 2014. Project WOO (Wave of Optimism), a 7-year-old non-profit founded by ex-Peace Corp volunteers, is currently working in Playa Gigante, Nicaragua to create a sustainable community based partially on surf tourism. They’re doing well with the program, however, they’ve turned to Indiegogo.com to help raise funds to do more. The non-profit has already started a surf-mentorship program where kids can earn donated boards through community service, initiated a waste management program, and procured a school bus that facilitates education. Our next project is a health center and we’re using the crowd-funding site indiegogo.com (link to our page) to help raise money from surfers who have been touched by this beautiful paradise. The organization is run in Nicaragua by Palos Verdes, California bred surfer Bo Fox, and the Executive Director stateside is Trent Gordon. Watch the edit, click the link to the Project WOO website for more info and then made a donation if you feel compelled. They’d like to raise $15,000 for this project and with 38 days left, they’re already halfway there. It’s hard not to feel good about what Fox and Gordon are doing. Especially when you see the smiles on the kids’ faces. ASP World Champ Joel Parkinson is hitting up school kids with the Surfaid message as the organizations newest schools program ambassador. It’s April 22nd and “everybody knows today is Earth Day, Merry Christmas, Happy Birthday to whoever’s being born,” and to celebrate the day, Burton Snowboards has announced that they have “stepped-up efforts” to support Protect Our Winters. 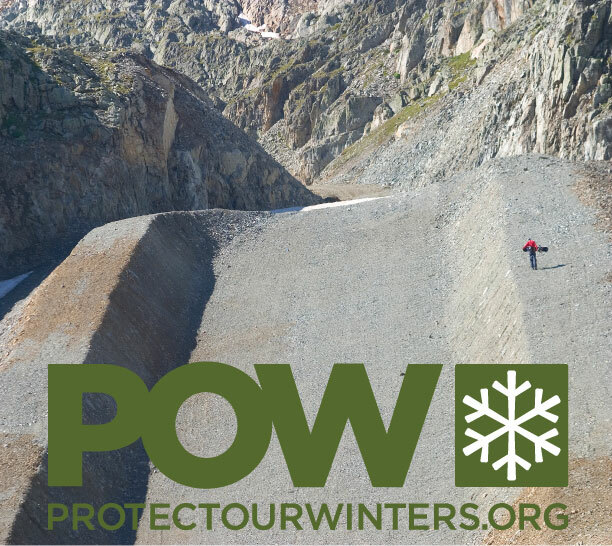 Jeremy Jones, Jones Snowboards, and Alaska’s Ultima Thule Lodge and helping to raise funds for Protect Our Winters with a raffle for three days of riding with Mr. Jones. Each time you donate $5 you are entered. The more you donate, the higher your chances of winning are. 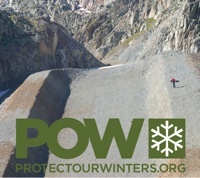 Help out POW and get a chance at riding some untracked by making a donation now. There are many ways to help those whose lives have been impacted by Superstorm Sandy and ERGO Clothing has chosen to channel their help through their own Restore The Shore Projects. Restore The Shore Projects was started by ERGO intern, Derek Koch, who is a 2nd year graphic design student at Rowen University in Glassboro, NJ. Koch and friend, Travis LeBar, started a Facebook page with Koch’s design, and it went viral overnight. “Derek was an amazing intern for us this past summer,” stated ERGO Co-Founder, Pete DiSpirito. “When he came to me with the initial design, we hit the ground running.” Product will be shipping within 7-10 days and 100% of the profits will be donated to various charities and organizations. In my native state of California, boarders and skiers are bracing for the effects of a warmer world. Scientists are predicting the Sierra snowpack will decline by 25 percent by 2050. We caught a preview this past ski season, when Lake Tahoe and Squaw Valley had to make their own snow well into February. It’s no wonder the California Ski Industry Association is a big supporter of AB 32, the state’s landmark clean energy and climate law. Click the link for the rest. . .